The Artist Collection Trunk Show is in the shop now through the end of February. All Trunk Show canvases are 20% off. If you can't get in here is the link to their web site. The Yarn Crawl is coming! April 14-17, 2016. We are taking pre-orders for the tote bags. $10.00 plus tax. They will be delivered prior to the crawl. We only have 20 on order to reserve yours today. The bag will be the same shape as last year's bag but the artwork will be different. I will send out more information about our Yarn Crawl events soon. Stay tuned! We are still taking sign ups for weaving with Deborah Jarchow. Description: Take it to the next level! If you already know the basics on your rigid heddle loom, learn to create beautiful textural patterns using pick-up sticks. The complicated-looking patterns can be achieved with relative ease. 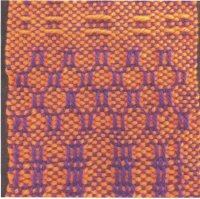 Make a beautiful sampler while mastering this technique and learning many lace-like patterns including windowpane, alternating warp or weft floats, and inlay. Supplies to bring: Measuring tape, 2 12” wider rulers or pick up sticks, 12” x 3” piece of light colored cardboard or manila file folder, 400 yards of worsted weight yarn in a solid color that is smooth, strong, non-hairy, and at least 2 ply. Or you can bring 200 yards each of 2 different solid colors.Tapestry needle, scissors, about 10-15 yards of waste yarn (acrylic works best), cardboard tube from inside a paper towel roll, 2 brown paper grocery bags. Description: By twisting or wrapping your warp yarns you can weave distinctive textures and patterns in your cloth. 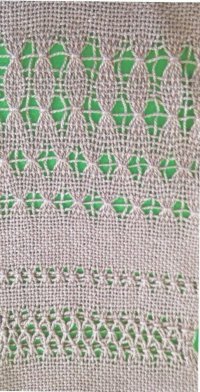 Learn to weave lace-like open areas as parts of a design throughout the fabric or as a notable edge treatment. You’ll learn how to make leno, brooks bouquet, and other fancy patterns. If you’ve been looking for ways to add more interest to your weaving, these techniques will get you there. You too can create cloth that is visually stunning. Supplies to bring: 400 yards of smooth, at least 2 ply, worsted weight yarn that is strong and not fuzzy (200 yards each of 2 different colors works well), scissors, tapestry needle, pick up stick, cardboard tube from inside a paper towel roll, 2 brown paper grocery bags. Join us for a Needlepoint Retreat in beautiful Santa Barbara. The Hyatt Hotel is located steps from the beach on Cabrillo Blvd. The meeting room has a beautiful view of the ocean and a lovely terrace for our daily lunch buffet. 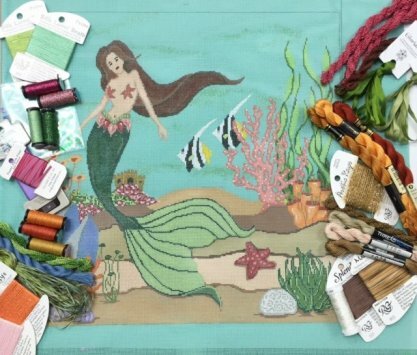 The incomparable Meredith Willett will guide you through the stitches for this exclusive canvas she has designed for us. A Welcome reception and Lunch each day. This beautiful canvas is on 18 mesh and measures 15X15. Local Trolleys are available to take you to downtown Santa Barbara where you will find wine tasting, great restaurants and fabulous shopping.